Parker Hannifin (Twin Filter) has its own range of Automatic Self Cleaning Filter units; TwinOmatic. A TwinOmatic Self Cleaning Filter is mostly used as a first step filtration of surface water, like sea, lake, river or canal water. 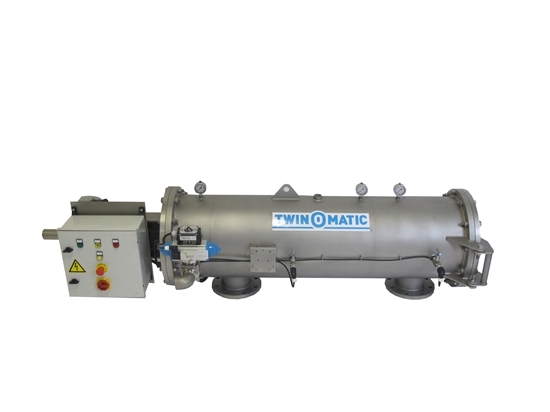 A TwinOmatic is highly effective in removing suspended solids down to 50 micron without flocculants, pre coats or granulated media. The TwinOmatic should be positioned directly after the water intake pump, and is normally equipped with one or serveral 50 to 150 micron screens. This pre treated water can than be used in a wide range of applications like: RO pre filtration, cooling water, pipeline flushing, general process water or injection water, used for enhanced oil recovery. minimal flush, less than 5% of the total flow, is used for its cleaning process. Our TwinOmatic self cleaning filter unit can both be horizontally and vertically possitioned. Special design for oilfield operations. Higher design pressure and temperature range.